You might not notice a bathroom vanity isn’t level at first; washing your hands or brushing your teeth won’t be affected. But try to set a round object on your wonky vanity and it’ll roll right off, and could shatter on your tile floor! So when you’re installing a new vanity it’s very important to bring it up to level. Wobble Wedges® make a great solution for bathroom shim needs because they are plastic and won’t be affected by water. Plastic wedges have lots of advantages, but those become especially clear when it comes to wet-rooms, like bathrooms, kitchens, utility rooms, and the outdoors. Using plastic wedges instead of wooden shims helps to prevent mold and rot that can occur when humidity is present. Wobble Wedge® plastic shims will provide you the stability you need for leveling and the security of knowing they won’t degrade over time. Follow the manufacturer’s directions for specific steps, but the following instructions follow a typical installation process. Put the entire vanity unit in place and draw a line along the top on the wall. Along this line mark where the studs are (use an electric stud finder or if the old vanity was located in the same spot, the old screw locations might tell you where the studs are). At this point removing the top/sink of the vanity and the doors/drawers can make for easier installation (refer to the manufacturer’s instructions). Using a 2ft level, check that the vanity is level front-to-back and side-to-side. 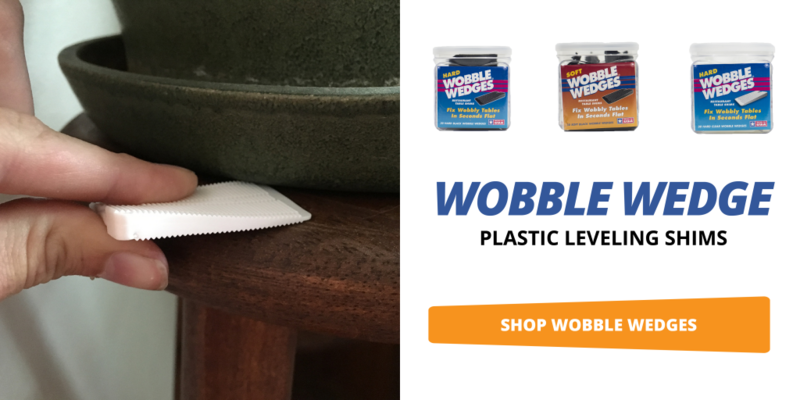 If it isn’t level, use Wobble Wedge® hard plastic shims to bring it up to level. We have three sizes of shims, and you can use any combination of them to get the height you need. BigGap are .48”, Standard are .25″, and Minis are .16″, and they can be safely stacked because the patented interlocking ridges prevent slips! Standard and Mini Wobble Wedges® can be scored with a utility blade and then snapped at the needed size. For BigGap Wobble Wedges® cutting them down to size may require a heavier cutting tool to remove the excess shim. Once you’re sure the vanity is level, verify that the back of the vanity is flush to the wall. If there is a gap caused by the wall not being plumb, you can use Wobble Wedges® to fill the space. The reason it is important to fill this space is because as you screw the vanity tight up to the wall it will pull the unit out of level. Use two (or more) Wobble Wedges® stacked at each stud where you will attach the vanity to the wall. Pre-drill holes through the mounting board and shims, and then secure the vanity with screws. Check for level again before you fully set the screws in place, and add more shims as necessary. Now your bathroom vanity is level, and you can proceed with the rest of installation!